MARINA DEL REY — Large dredging equipment was moved into Marina del Rey April 5 to begin a $13 million dredging project that will deepen Marina del Rey’s north and south harbor entrances. Since the last dredging project in 1999, more than 1 million cubic yards of sediment from Ballona Creek and nearby beaches has settled around the channel entrance, leading to navigation hazards. “We get probably 20 to 30 boats in the summertime that will actually run aground, so we’ll go and we’ll have to tow them off,” Los Angeles County Fire Capt. Brian Hogue told an ABC 7 News reporter. The shoaling has also raised concerns about the ability of the area’s first responders to get in and out of the harbor in emergency situations. An 87-foot Coast Guard cutter is stationed in Marina del Rey, and it could be limited in its ability to enter and exit the harbor in low-tide situations. San Rafael-based Dutra Dredging Co. moved in at the beginning of the month with its 2,095-ton derrick barge Paula Lee. 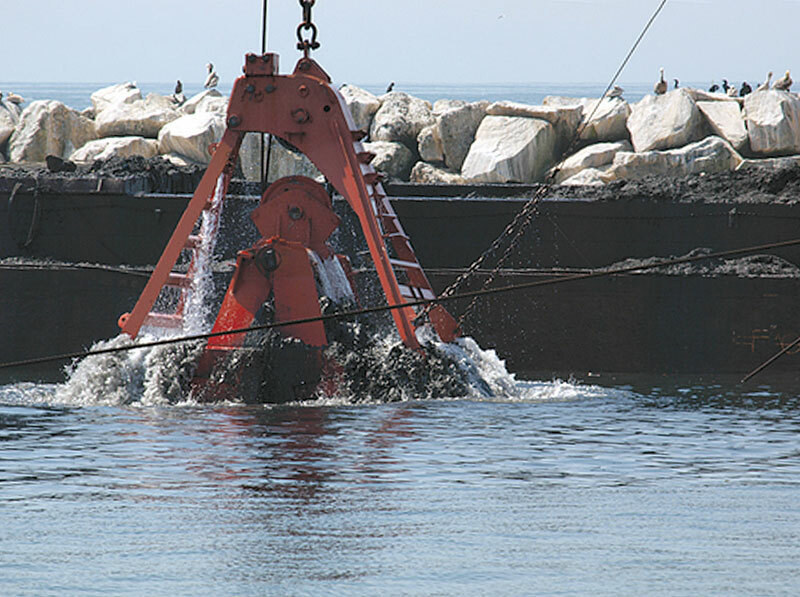 The clamshell dredge will dig up 520,000 cubic yards of sediment from the ocean floor that was deemed unsuitable for ocean disposal, and it will be barged to the Port of Long Beach’s Middle Harbor Project. “The way we’ve been able to do this, finally, was that we took on a very important partner — and that was the Port of Long Beach,” Knabe said. The two projects have benefited each other, as Marina del Rey needed a place to remove its contaminated sediment, and the Port of Long Beach needs nearly 2.3 million cubic yards of sediment to use as fill for part of its $650 million Middle Harbor redevelopment plan. The port has been requesting sediment from outside sources to fill in nearly 54 acres of water area between marine terminals at Piers E and F in Long Beach Harbor, where the port plans to create land to build a modern shipping terminal. The Confined Aquatic Disposal cell in Long Beach gives nearby harbors with sediment contamination problems a cheap and efficient alternative to dispose of materials that otherwise would require costly transportation to approved inland landfill sites. “We are taking over 47,000 truck trips off the road that would be required to take this to landfills inland, so this is huge,” Knabe said. In addition to the contaminated sediment making its way to the Port of Long Beach, around 215,000 cubic yards of clean sand will be transported to Redondo Beach and Dockweiler State Beach as part of Los Angeles County’s beach renourishment program. “This project provides benefits at three different locations and demonstrates the sort of multiple beneficial uses that are becoming a necessity in today’s era of increased environmental awareness and diminished financial resources,” said Army Corps of Engineers Lt. Col. Steven Sigloch. “Environmentally, it’s a great project for all of us; financially, it’s a great project for all of us; and most importantly, the public safety aspect of all of this is important for everyone,” Knabe said. Dredging is expected to take place around the clock, seven days a week. However, it should not create any disturbances for Marina del Rey residents, because of the project’s location at the channel entrance away from homes, according to the Corps of Engineers. Costs of the project will be divided: The county will pay $5.3 million and the Corps of Engineers will contribute $7.7 million. Long Beach is expected to pay to move about 100,000 cubic yards of material. At completion, Marina del Rey’s channel entrance depth is expected to be 20 feet Mean Lower Low Water or a depth of 20 feet during low tide. The dredging is expected to be completed in late summer, with the Redondo Beach sand restoration to continue through fall.